When we moved to our house we hesitated about keeping our old white Ikea Klippan sofas, bought at a time when we were earning our first salaries. In the end I decided I loved their simple and timeless design and that I would wait until the children were older to buy ‘serious’ sofas. In terms of cleaning, so far I (almost) managed to get back to the original white by washing them and using a lot of Vanish. When that no longer works I will simply buy new covers from Ikea or online from www.bemz.com. 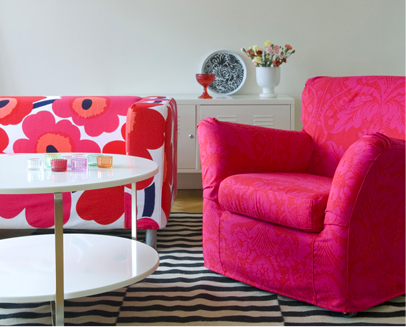 At Bemz you can find over 160 original designs and colours would fit Ikea sofas, including beautiful fabrics from Designers’ Guild, Marimekko and other designers. You browse by the Ikea sofa name and typology so you’ll be sure that the covers will fit perfectly once you’ve removed the original lining. If you have a non-Ikea sofa you can find covers at online stores such as www.laredoute.be (in the House Linen section). You can choose them by looking at the typology of your sofa (2 seater, 3 seater, etc.). These covers are designed to be put over your sofa, so they are adaptable to various models. Francesca Picks: Is your dining table dimly lit?